A long flight, hardly any sleep and 6 hours time differece took it’s toll on us, so we slept in, had a lazy morning and didn’t go out before 1 PM. 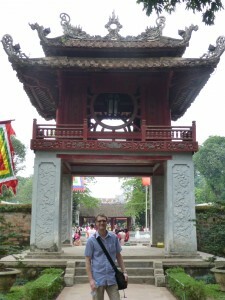 We spent most of the day sightseeing the main sights in Hanoi, and ended up walking more than 10 km. Since it was Monday museums and some sights were closed, but we still got to see pretty much what we had planned. 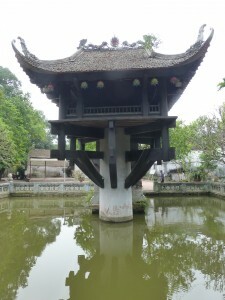 We walked past the Lenin park on our way to the One pillar pagoda, and continued to Ho Chi Minh Mausoleum and the Presidential Palace. The Temple of Literature was beautifully decorated and filled with students celebrating their graduation, which made sense since it was founded in honor of the philosopher Confucius in 1070 and later served as a center for higher learning. We walked around in the Frech Quarter for a while before a short stop at Hanoi’s most important church, the St. Joseph’s Cathedral. We had decided that if possible we wanted to go to Cambodia the next day, so we went back to the hotel to ask them to help us book. They found a flight to Siem Reap in the afternoon that was not too expensive, so we told them to book it and we booked a hotel ourselves online. We celebrated our new plan by going to the brewpub Gammer beer. They had 3 beers brewed on the premises, Gold, Golden and Dark. We ordered two different ones, but got quite confused when the brought us two dark ones. Shortly after they brought us two golden ones as well, and explained that it was “Buy one get one free”. 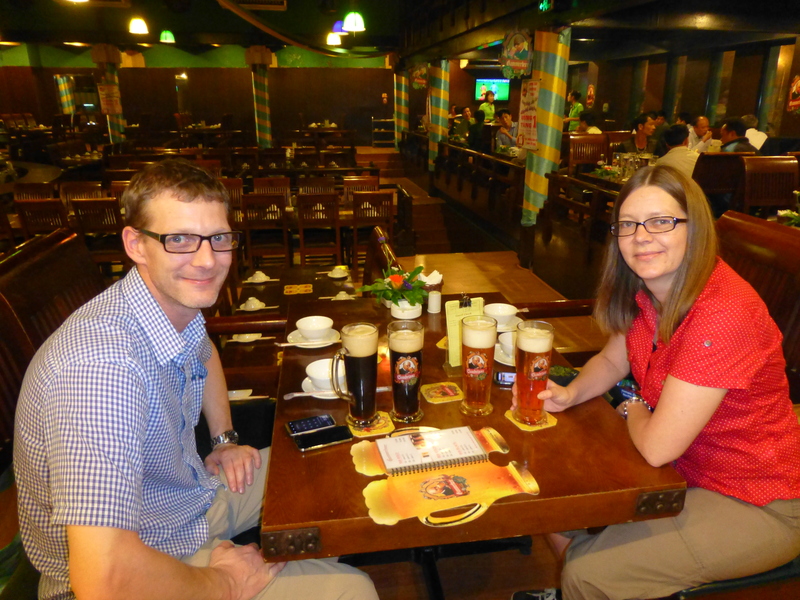 After a bit more beer than planned, we went for dinner at a recommended restaurant (New day) very close to our hotel. It was very busy, but we got a table on the top floor. It was a very charming place, and the food was really, really good. We tried several local dishes like the famous Bun Cha. We took a short walk up to Quan Chuong, the only remaining gateway to the Old Quarter, before heading back to the hotel to do some blogging and planning. We tried to go to bed early, but instead ended up playing music and emptying the mini-bar. Still a bit jet-lagged maybe?